The northern third of Chad is a desert with vegetation cover found only in special niches where it can survive. Land cover was mapped only in the southern two- thirds of Chad, where seasonal vegetation and longer term land use and land cover dynamics are in play. In the mapped area, Sudanian and Sahelian savannas are the major land cover classes, accounting for half of the country’s land surface. Steppes also constitute a dominant land cover, covering 22 percent of the area mapped. Whereas the area of steppes remained relatively stable, savannas show a clear reduction between 1975 and 2013, especially in the Sudanian zone where they lost about 17 percent of their area over the 38 years. 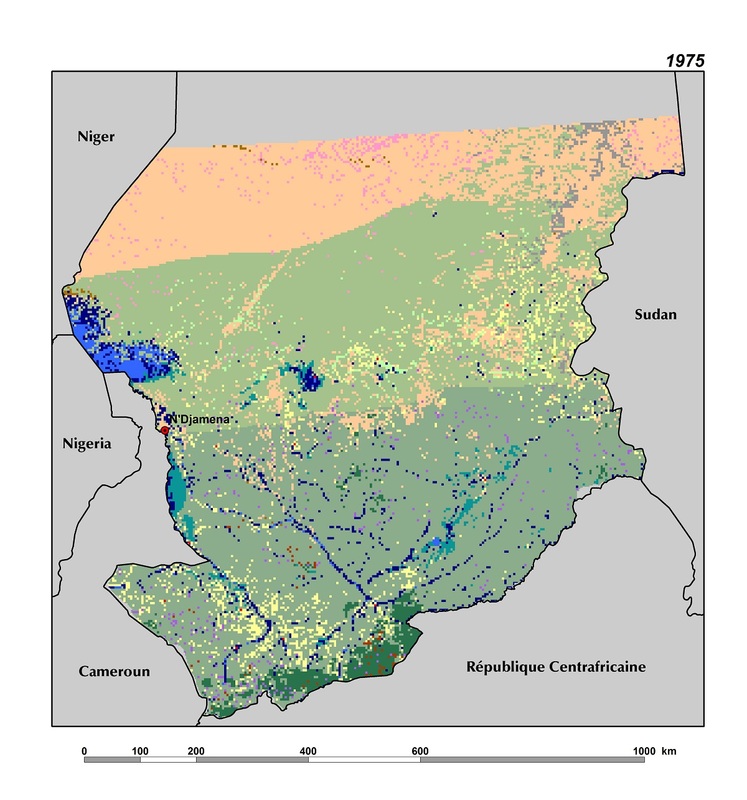 Driven by an accelerated population growth and concomitant food demand, agricultural expansion is the main driver of the loss of Chad’s natural landscapes. Between 1975 and 2013, the annual rate of agricultural expansion was 5 percent, one of the highest in the region. This means that croplands almost tripled between 1975 and 2013, although this expansion is not uniformly distributed across the country. The spread of agriculture occurred mainly in the south, especially in the Bassin and Plaines du Logone (BLO and PRL – Basin and Plains of Logone), Collines du Mayo-Dala (CMD – Hills of Mayo-Dala), and Maro (MRO) ecoregions. The transition area between the Sahel and Sudan climate zones is another area of steady encroachment by croplands, especially in the regions of Ouaddaï, Lake Fitri (LFS and LFT), and around N’Djamena. In these regions, agricultural landscapes now dominate the savanna. Deforestation is a major environmental concern in Chad. Woodlands, mainly located in the south, have diminished by 29 percent between 1975 and 2013, amounting to a very significant loss of 4,700 sq km. The area of gallery forest also declined, but not as rapidly as woodlands. Their overall land surface was always relatively small, but it has decreased by 8.3 percent, a 400 sq km loss between 1975 and 2013. In the Sahel regions of Bahr El Gazal (BEG) and Kanem (KAN), sandy areas have grown in a patchwork fashion, pushing into the steppes. Droughts in the 1970s and 1980s, as well as grazing pressure, have destabilized the already sparse vegetation cover, allowing the underlying sands to become more mobile. Between 1975 and 2013, sandy areas have increased by 22 percent. 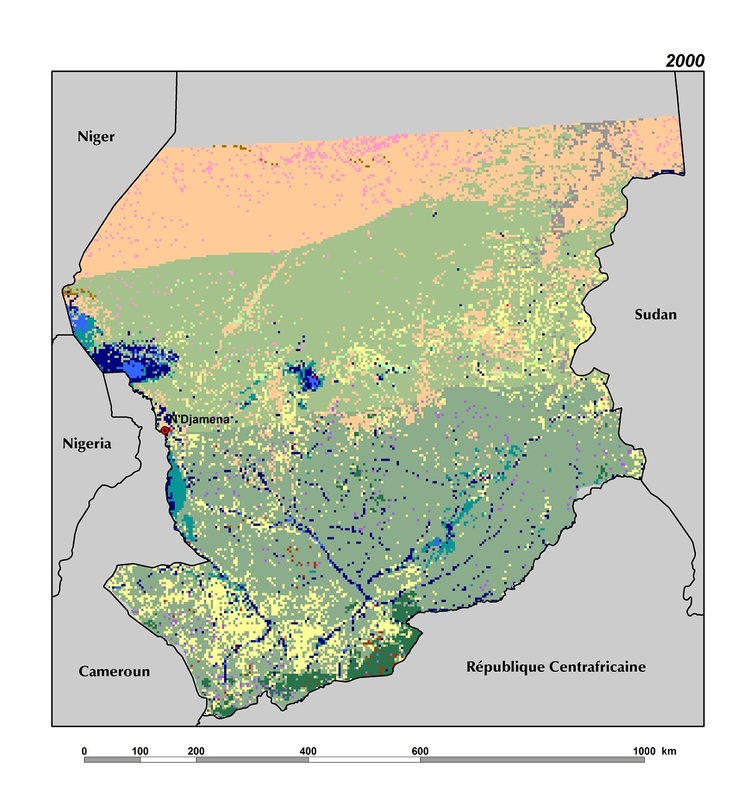 The reduction of surface water in Chad (a loss of 60 percent of surface water between 1975 and 2013) is mainly a result of the receding area of Lake Chad. Over 38 years, the overall surface area of the lake reduced by 87 percent. This is a concern not only to Chad, but to the region. Rainfall shortages combined with heavy use of the lake and river waters to irrigate and a major population increase in catchment area account for this decline. The entire northern basin, which had water as recently as 1975, has completely dried out, replaced by steppes and herbaceous savanna. In 2013, only a core area of the southern basin still had water. In contrast, the smaller Lake Fitri, also situated in Chad’s Sahel Region, appears to have been spared by the drying process. Lake Fitri’s area did not change much between 1975 and 2013. Nevertheless, the lake’s northern wetland area decreased, and agricultural pressure around the lake has visibly grown. These changes in the country’s water resources have impacted its socio-economic life. There has been a migration of population toward the south where rainfall and pastoral resources are more abundant. The dramatic decline in the extent of Lake Chad has stranded many communities that are dependent on fishing and gardening, further fueling migration to Chad’s urban areas. The recent oil boom in Chad is another factor affecting population migrations, changes in land cover, and natural resource degradation in the south, especially at Doba and Bongor. Chad became an oil exporter in July 2003, after over 30 years of prospecting by various international oil companies. Two years later, the country joined the African Petroleum Producers’ Association (APPA) and created the Hydrocarbon Company of Chad in 2006.